A distinct cup of coffee. Back in coffee land once again, a place where dreams come true (if that dream is to stay awake all night and need the toilet randomly), Test Pit Towers is filled with the scent of freshly brewed espresso. Our recent coffee reviews have all been fairly technological, so this time round we wanted to test something simple, effective, and - in our case at least - as much essential to every home as running water and electricity. 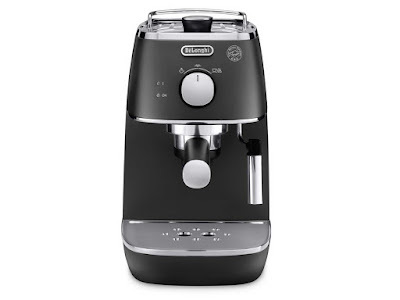 We crank up the DeLonghi Distinta Espresso Machine. 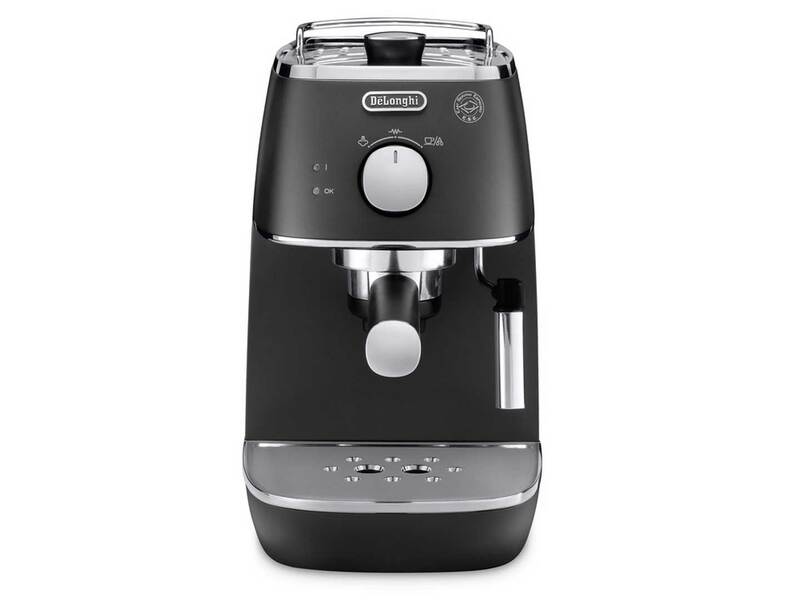 This handsome machine is part of DeLonghi's Distinta range which includes, among others, kettles and toasters. 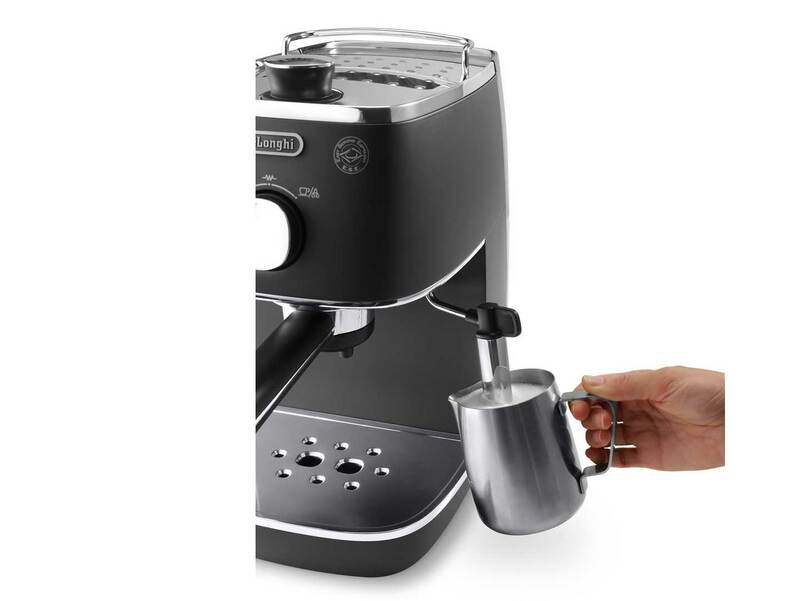 We're glad that an espresso machine has been included in what is essentially a kitchen 'must haves' collection, as good quality coffee is becoming just as vital as toast these days. 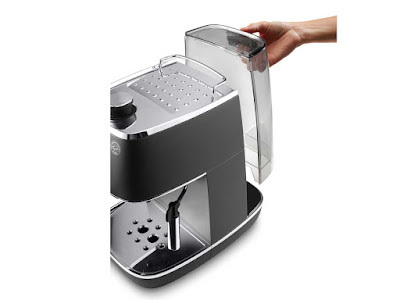 The machine itself features a removable water reservoir, a cup warmer on top, a steamer arm for frothing up some milk, and three different ground coffee filters. Oh, and we think it looks bloody lovely. Pump espresso machines are everywhere, so its nice to find one that actually looks great. The matte metallic finish has bright and shiny chrome details, and as well as the black version we were sent to test, the DeLonghi Distinta Coffee Machine also comes in copper, bronze and white. We know, no primary colours. This is a good thing – after all, its the coffee that should be waking you up in the morning, not the colour of the machine. The coffee arm locks and unlocks with a very satisfying amount of firmness, but never feels so tightly in there that you have to brace the machine to get it out. The arm comes with a choice of three metal filters; two for ground coffee, and one designed to accommodate an ESE coffee pod. From switching it on to that all important green light coming alive indicating the machine is ready, takes no more than a minute, giving you enough time to load up with coffee. All varieties of coffee we tried with the machine produced fine espresso with a healthy head of crema. One thing that we did notice however, was that if you ground your beans too finely, the DeLonghi Distinta Coffee Machine tended to struggle a bit, getting clogged up in the filter and pouring out the espresso far too slowly. But this is just something you have to learn with every new machine; different filters have a preferred ground size to get the espresso right. Play about like we did – it's quite a fun process. So for a machine that looks great, and isn't too much of an imposition on your kitchen's counter space, this is great. It does exactly what it says on the tin and won't cost you an arm and a leg. Just how much do arms retail for these days, anyway?